Foothills, montane. Openings, wet areas, disturbed areas. Summer. 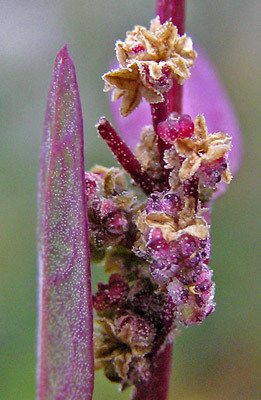 Chenopodium atrovirens grows from just two inches to two feet tall. Flowers (not shown here) are 1/16 inch minute but are numerous in tight clusters. 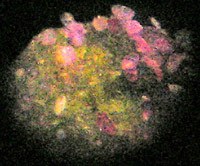 The flattened spherical fruit is enclosed in five sepals (red in the photograph at left), each of which is keeled and often dotted with microscopic white-to-pink grains. These grains are shown below in a microscope photograph of the tip of one sepal. Linnaeus named this genus in 1753 and Per Axel Rydberg named this species in 1900. Greek gives us both "chen" for a goose and "pous" for a foot. 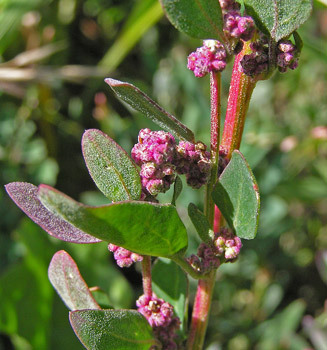 (The "ch" in Chenopodium is pronounced as the "k" in "key": key-no-po-dee-um.) "Atrovirens" means "dark green". Lower Stoner Mesa Trail, September 5, 2007. Some seed pods have emptied and the star-shaped, symmetrical, tan and red pod is left behind.